If Joe Simon had only created Captain America back in 1940, he would still be a comic book legend. However, Simon’s career lasted for decades and encompassed the creation of dozens of memorable characters and thousands of pages of stories and art. Simon, both with and without his partner, Jack Kirby, was an innovative writer, editor and artist, responsible for some of the most influential characters and trends in comic book history. He was nothing if not versatile. Indeed, it’s impossible to consider Joe Simon’s career without looking at the entire history of the comics business, since he was there almost from the industry’s inception. Among the many classic characters Simon either created or co-created were Captain America, the Red Skull, the Blue Bolt, the Fiery Mask, the Young Allies, the Newsboy Legion, the original Manhunter, the revamped Sandman of the '40s, Stuntman, the Boy Explorers, Boys’ Ranch, the Fighting American, the updated '50s Shield, the Fly, B-Man, the Outsiders, Shieldmaster, Captain 3-D (cashing in on the '50s craze for 3-D comics and films), the western hero Bullseye and camp classics like Brother Power the Geek, and Prez, the Teenage President, and the Green Team: Boy Millionaires. Simon and Kirby also created the romance comics genre, as well as writing, editing and drawing the excellent horror title Black Magic title for Prize Comics, which was later revived for a 7-issue run for DC when Simon was resumed new work for DC in the '70s. Simon also enjoyed a long run as the creator/writer/editor/artist for Sick magazine, one of the most long-lived of all the Mad magazine imitations that sprang up in the wake of that humor title’s extraordinary success in the 1950s and '60s. Born in Rochester, New York, Simon was brought up in the family of a poor Jewish tailor, but realized early on that he was not destined to follow in his father’s footsteps. As he noted in The Comic Book Makers: “As long as I can remember, drawing was my passion.” Simon attended Benjamin Franklin High School, where he began dabbling in the art world by acting as the art director for his high school newspaper and year book. He sold his first professional art while still in high school, they were yearbook section “splash pages” executed in gray tempera paint that were re-used by two different universities’ yearbooks, for which he was paid the then-respectable sum of $20. Simon graduated high school in 1932 and was soon hired by the Rochester Journal American as the assistant art director. In addition to his production tasks, Simon also occasionally contributed sports and editorial cartoons to the paper. Two years later, Simon moved on to the art department of the Syracuse Herald in Syracuse, New York, where he also created sports and editorial cartoons. He was soon hired as the art director for the Syracuse Journal and the Syracuse Sunday American for a whopping $60 a week, an excellent salary at the time. Unfortunately, both papers soon went out of business, and Simon, then 23, migrated to New York City in search of work. One of his first jobs in New York was working for Paramount Studios as a photo retoucher in their New York City offices, a job the talented Simon found personally unfulfilling, and he quickly left for a short stint doing spot illustrations for McFadden Publications. Simon abandoned that to pursue what he hoped were greener pastures in the then-emerging comic book business. Simon got his first work in comics from Lloyd Jacquet’s Funnies Incorporated, an early packager who supplied complete comic strips to publishers who didn’t want to invest in assembling their own staff, but were still hoping to cash in on the new medium. Simon began working for Funnies Inc. From there, Simon was off and running in what was to be one of the longest and most storied careers in the comics business, including working as the first editor for Fox Comics, creating the Blue Bolt for Fox Comics, then after the first issue, teaming up with Kirby for less than a dozen issues on the title before leaving to create Captain America. Four days after going to work for Funnies, Inc., Simon was called in to meet with Martin Goodman, publisher of Timely (later Marvel) Comics, and given an assignment to create a fiery new superhero to imitate Timely’s own Human Torch. In Europe, the Nazis were marching. Hitler and his Stormtroopers splashed across the headlines daily. News dispatches of the persecutions, the concentration camps, the incredibly cruel Gestapo tactics seemed to Americans an ocean away more like a grade “B” movie than reality. Then the idea struck home: here was the arch villain of all time. Adolph Hitler and his Gestapo bully boys were real. There never had been a truly believable villain in comics. But Adolph was live, hated by more than half of the world. What a natural foil he was, with his comical mustache, the ridiculous cowlick, his swaggering, goose-stepping minions eager to jump out of a plane if their mad little leader ordered it. (After a stiff-armed Heil Hitler salute, of course.) I could smell a winner. All that was left was to devise a long underwear character to stand up to him. I wrote the name “Super American” at the bottom of the page. No, it didn’t work. There were too many “Supers” around. “Captain America” had a good sound to it. There weren’t a lot of captains in comics. It was as easy as that. The first issue of Captain America (cover-dated March 1941) hit the newsstands in December of 1940, almost a year before the Japanese attack on Pearl Harbor that brought the U.S. into World War II on the side of the Allies. What was astonishing about this cover was that it depicted Captain America, socking Adolph Hitler (a sitting head of state) on the jaw a year before the U.S. declared hostilities with Nazi Germany. This was a gutsy and controversial move on the part of Timely publisher Martin Goodman. It paid off in terms of sales: The first issue sold almost a million copies, an amazing feat for a brand-new character. But it also aroused the wrath of Nazi sympathizers and Bundists in the U.S., and the Timely offices were flooded with hate mail, obscene, threatening phone calls, and the appearance of groups of menacing men in the neighborhood around the Timely offices. Many of the Timely staff were in fear of their lives, but then-mayor, Fiorello LaGuardia, supported what Simon and Kirby were doing and made sure that there was a constant police presence to safeguard Timely’s offices and staff. Among Simon’s greatest later accomplishments was the publication of The Comic Book Makers, co-written with his son, Jim. It remains one of the liveliest, most insightful, best-written accounts of the early days of the comics, containing stories, anecdotes, and profiles of many of the major personalities in the creation of the comics business, including DC Comics’ publisher Jack Donenfeld, Timely (later Marvel) Comics publisher Martin Goodman, and his nephew, Stan Lee, who would go on to become a legendary writer/editor for Marvel in the '60s and '70s, Fox Comics’ Victor “I’m the King of the Comics” Fox, Alfred Harvey of Harvey Comics, Charles Biro, creator of the fabulously successful Crime Does Not Pay, the original Daredevil and Boy Comics, his colleague, the doomed and tormented Bob Wood, and reprint king Israel “What do I need with copyrights?” Waldman, and many other fascinating characters. Originally published in 1990, the book sold well enough to go through several different printings, eventually being reprinted in a new edition by Vanguard Productions in 2007. In addition to its historical value, The Comic Book Makers is also very entertaining and frequently very funny, a testament to Joe Simon’s skill as a writer. In later years, Simon waged a legal war with Marvel Comics to regain ownership of the copyright to Captain America and achieved some success. In 2002, as Michael Dean reported in The Comics Journal #249 (December 2002), "The Second Circuit Court of Appeals ruled that an agreement between Joe Simon and Marvel Comics did not preclude him from filing to reclaim copyrights as Captain America's creator." This judgment opened the way for Simon to take further legal against Marvel. The following year Marvel announced that it had agreed on a settlement with Simon, the terms of which remain confidential. A true professional, Simon was busy right to the very end of his life, working with Titan books to publish multiple volumes of The Simon and Kirby Library, including: Simon and Kirby Superheroes; The Complete Fighting American; The Best of Simon and Kirby, Crime, a collection of their crime comics from the 1950s; and an upcoming collection of romance comics (a genre the Simon and Kirby team originated). Simon also found time to write an autobiography entitled: Joe Simon, A Life in Comics (2011), which was essentially a reworking of some of the material found in The Comic Book Makers, with the focus firmly on Simon and Jack Kirby, and less emphasis on the other bizarre and colorful characters Simon encountered during his long career in the comics business. For more on Joe Simon: Gary Groth's 1990 interview; Michael Dean's report on the 2002 judgment (PDF only). Some time in the mid-nineties there was an ad published in a current DC comic for Joe Simon’s book The Comic Book Makers. The ad included a NYC based address from which one could place an order. Being a freshly arrived young, naive, and poor resident of the city at the time, I thought I’d drop by the address to see if I could save on shipping costs. I walked in with a copy of the ad and explained to the doorman what I was looking for, and after about a five minute wait who steps out of the elevator but Joe Simon himself with a copy of his book. He was gracious, charming and engaging, and we chatted for a bit. Within a few moments, following no prompt from me, he extended an invite to come upstairs and see his studio. I spent a glorious half hour with Mr. Simon, looking at some recreations he had painted as well as his work-in-progress cover for the second TPB of Captain America reprints Marvel had commissioned from him. I asked him if any of this work was for sale, and he gave me a smile and said “I’m sorry, Lou, you couldn’t afford it.” I accepted this without protest, happy in the knowledge that his skills were still in demand. When I heard the news of his passing yesterday I pulled out my copy of The Comic Book Makers. It’s signed “To my pal, Lou” and I sat there staring at it for quite a while. During my visit, Mr. Simon happened to mention that he befriended a young guy in his building who recently broke into his place and stole quite a bit of his classic art. Mr. Simon gave me the impression of being a shrewd man – yet he still invited me, a complete stranger off the street, to visit his workspace after being robbed by another “fan”. The man clearly regarded anyone with an appreciation of comics as a friend first and foremost, and I think that’s something that’s almost as important to remember about him as the nearly uncountable number of entertaining comics he left behind. Along with the Eisner shop, the Kirby-Simon shop was the central place where the aesthetics of American comics developed in the 1940s (and arguably the 1950s as well). The work the Simon/Kirby shop did tends to be underrated because a lot of it was in genres that have been long undervalued by fans who have a superhero-centric view of comics history (I’m thinking here primarily of the romance comics, but also the westerns, war, and kids gang comics). It’s gratifying to know, however, that in the last few years there’s been a new appreciation of the importance of the Simon/Kirby team and their shop: witness the Simon and Kirby blog maintained by Harry Mendryk and the recent series of Simon/Kirby books from Titan. Many of the comic book storytelling techniques we take for granted were developed by Simon, Kirby and their crew. Jules Feiffer made this point many years ago but it isn’t widely appreciated. Now that more grounded and realistic histories of American comics are starting to emerge, an appreciation of the importance of the Simon/Kirby will only grow. @ Pat: That Blue Bolt cover is credited entirely to Joe Simon. The Captain America page is Simon inks. The cover you linked to is not in fact Simon. Dan, A lot of the credits for art from that era is opinion. The cover for Blue Bolt #1 is by Simon in my opinion. I’m certainly not the only person who thinks it’s Simon’s work. Before hooking onto Kirby Simon was frequently swiping from Lou Fine, and imitating his style. There are many similar examples. There is also difference of opinion on Blue Bolt #3. Some people say it’s Kirby a few think it’s by Simon. My opinion is it’s penciled by Kirby, and inked by Simon. The Captain America page looks to me like Kirby contributed the inset panels on the left. He may have done some inking on the main Captain America figure. He certainly wasn’t responsible for the drawing of the White House in the background. I think Simon penciled most, if not all of the cover for Captain America #1 aside from the CA figure, and even that looks something like Simon to my eye. Simon wasn’t Kirby’s inker. Simon did a fair amount of penciling in the 40’s, and his panels and pages are generally easy to pick out. There are times when it’s difficult to tell, because Simon borrowed so much Kirby. For example The Titan “Simon and Kirby Superheroes book page 217 the first panel drawn by Kirby, is later used by Simon in a Fly story on page 447 of that book. I’ve looked at this stuff very carefully and like other people who have looked at it I’m confident in my own conclusions. I was at the 1972 New York Comic Convention, or Seuling Con as we called it, and Jack Kirby was there with Steve Sherman selling copies of KIRBY UNLEASHED and the Gods posters. I was there at the table with Steve and Jack when Joe Simon stepped up and it was apparent that they hadn’t seen each other in many years. The table was closed and Steve and I accompanied Joe and Jack up to Jack’s room, where they took off their shows and lounged on the beds, gabbing and catching up as Steve and I stood there goggle-eyed being present at this auspicious reunion. The age of giants is indeed over, wouldn’t you know that Stan would be the last man standing? Hey, What about Joe Kubert? Of course he’s not quite as old as some of the people he broke in with, but can you hold it against a guy because when he started in the business in 1938 at the Harry Chesler’s shop he was 12 years old? It’s just too depressing to respond to you, Pat. Life is too short. Bryan Munn has a list of Golden Age creators who are still with us. Several of those names are guys who I had thought left this mortal coil. A few, like Kubert, go back to the dawn of the Golden Age. This ends with Dan and Patrick rushing lustfully into each others’ arms, right? No matter how much I irritate Dan, I’ll always like him a lot, because he publishes a lot of great comics. 1-800-Mice (one example) deserves much more attention than it’s received, and part of that might be Dan is uncomfortable promoting his own books on a site where he’s the .com editor. The Picture Box site has excellent content, but not the exposure a place like this has. Early next year Fantagraphics is publishing a collection of Simon and Kirby’s romance comics. This seems a bit strange to me, as Titan has been publishing S&K books for a couple years now. Did Fantagraphics work with Simon on this collection? Is any of the profit this book might generate going to the estates of Simon or Kirby? Or is this all simply public domain stuff? For a good look at art which is absolutely the work of Joe Simon here is an excellent multi-part serial post. There are a few things which might be the subject of debate, but examples which are clearly the work of Joe Simon abound in the series of posts. Hilariously, those posts are where I gleaned the credits for the art above. I know there’ll be some reason why your use of that resource is, in your opinion, more reliable than anyone else’s. Can’t wait to read what it is! I’m on the edge of my seat! OMG! It’s a great series of posts. Harry is clear his opinions are not shared by everyone who looks at the art, and says in several places he might change his mind from time to time. There are things there signed only by Joe Simon, or which aren’t disputed by anyone though. For example the “Swabs” splash page at the link. Any chance of a Matthew Thurber interview in the cards? What an incredible imagination he has. The Sean Collins review was dead on. I knew there’d be a good reason. Phew! Woulda been disappointed. Joe Simon was one of the greatest creators in comics, its very sad to receive the news of his death. Captain America was his most famous creation, but Fighting American, Lancelot Strong, the Fly, the fiery mask and other superheroes shouldnt be forgotten. Mainstream press isnt mentioning them at all, its nice, that they are mentioned in the orbituary. So, no one knows if Fantagraphics actually got Simon’s cooperation for their upcoming Simon/Kirby Romance book? I mean, this is a Fantagraphics sponsored site, correct? Hello-ooo-ooo? So no one managing this site has any contact with anyone who would know? Just wondering, because Fantagraphics has been so staunch in their supporting creator’s rights. There’s apparently a rumor circulating around the ‘net that this isn’t the case, that Fantagraphics is simply publishing this without paying the estate of either Simon or Kirby… surely, someone associated with this website knows if this is correct or not… I see Thompson posting here all the time! Sorry, Diamond. Don’t you know you have to say my name three times, like Beetlejuice? So far as I know Simon (up until his recent death, now his heirs) retained the copyrights to some (much?) of his work, which meant that a publisher who wanted to publish a series of wide-ranging collections of his comics would be legally obligated to license the work from him. Hence, I would assume, Titan’s licensing deal. (There are a few Steve Ditko stories from the period of our “Ditko Archives” books which Simon owns; we attempted to license them from Simon through his agent and were turned down –well, more like ignored– presumably because of his ongoing Titan deal. So we didn’t include those stories.) I emphasize again that I have no knowledge of the inner workings of Titan’s dealings with Simon and this is all (I hope informed) conjecture on my part. Thank you for taking the time to give a thorough answer. However, I have to say that I find said answer somewhat disturbing… you’re saying FB isn’t giving any of the profit made on this book to the respective cartoonists’ estates simply because you don’t legally have to? Not to be overly dramatic, but this seems to go against what the company was founded on. I can remember numerous instances in the Journal where DC/Marvel/whoever was called out for not doing the right thing, regardless of legality. Again, thanks for taking the time to answer, despite no one else being interested… believe me, the reason I am so interested is because my ideas/thoughts on creator’s rights and publisher etiquette were shaped extensively by the Journal. And, not to knock the restoration/editorial work that went into this collection, but it seems ironic to me that Gagne would get compensated before the cartoonists that produced the actual work. A logical, and legal, answer to your question would be that if material is in the public domain, then there are no rights remaining in the material. With one caveat: Simon had plenty of time before now to exploit that material, as it was owned by him and/or the Kirby estate. Having said that, though, a fee paid to the Simon and Kirby estates would be nice but not required. No one from Fantagraphics contacted Joe Simon or anyone associated with Joe about Fantagraphics’ intention to publish a S&K romance book. Joe found out at the last minute. Before Fantagraphics, Gagne first proposed the book to Dark Horse . Dark Horse showed a “print on demand” copy of the book to Joe. Dark Horse said they would only print the book, with payment and royalties, if Joe approved. Mike Richardson, publisher at Dark Horse, you showed integrity. Fantagraphics, in my opinion, showed their true colors by how they went about the matter. When Fantagraphics’ co-publisher, Kim Thomson, makes a statement (above) that “When work has unambiguously fallen into public domain, creator’s rights become moot”, I have to agree with DiamondDuliu’s statement that “this seems to go against what the company (Fantagraphics) was founded on (championing creator rights). In this day and age, thank goodness the Marvel and DC–the very companies that Fantagraphics riled against–pay handsome royalties to the creators and heirs. Actually, Joe Simon had an authorized edition scheduled that would have collected the romance material. Titan announced the series of books back in 2008 (http://www.icv2.com/articles/news/12658.html), and the romance volume was included in the ad in the back of THE BEST OF SIMON AND KIRBY, published in May 2009. Titan paid Joe and the Kirby Estate advances and committed to ongoing royalties on all of the books, regardless of the pubic domain nature of any of the material. Because the Fantagraphics book limited the viability of a second volume, the romance book was switched to science fiction, which will be followed by an authorized horror collection. Joe himself negotiated the payments for the Kirby Estate, out of dedication to Jack and his family. Oh, and all of the material includes the appropriate copyrights for Simon ad Kirby. None of the material is copyrighted to any third party. The cover of Blue Bolt #1 wasn’t Joe’s work, but the cover shown above is pure Joe. He often commented on how he and Jack worked hard to make their work flow seamlessly together. You are welcome to your opinion. 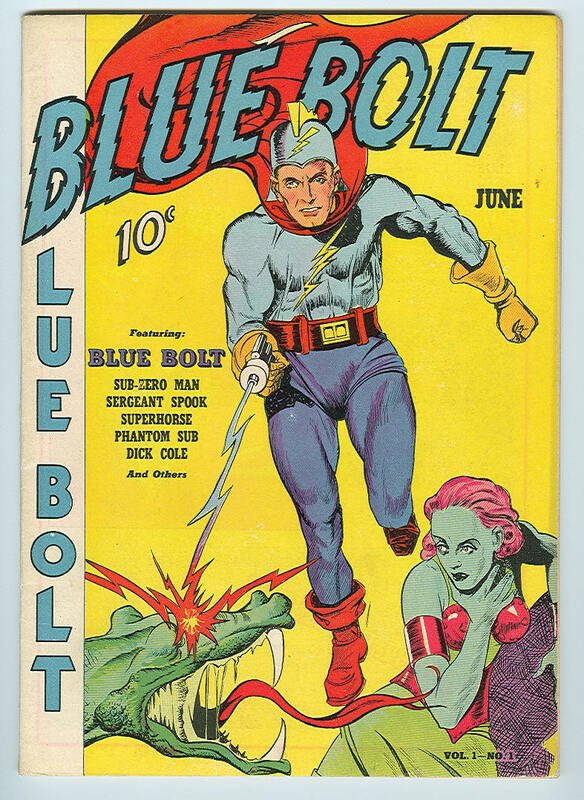 I have little doubt the cover of Blue Bolt #1 is by Joe Simon it’s one of his attempts to mimic Lou Fine. Swiping from and imitating Fine were typical of Simon during that time. Although the Blue Bolt cover illustrated above is clearly swiped from Alex Raymond’s Flash Gordon page 3/29/36 the swipe looks like Kirby’s work to me. The drawing is far to assured to have been executed by Simon, notice Kirby has deftly “flipped” the torso from the way Raymond drew it.